What is one of every woman’s concerns during pregnancy? Well besides swelling feet, headaches, backaches, nausea, and so on. It is stretch marks! This is the fate of every pregnant woman, right? According to a lot of skin care companies out there us pregnant ladies have so many new products we can try to prevent these hideous scars from showing up so according to them that is wrong! One of those companies is Mambino Organics. I recently got the chance to try out their belly butter and the other products that come in their Bun in the Oven Kit. 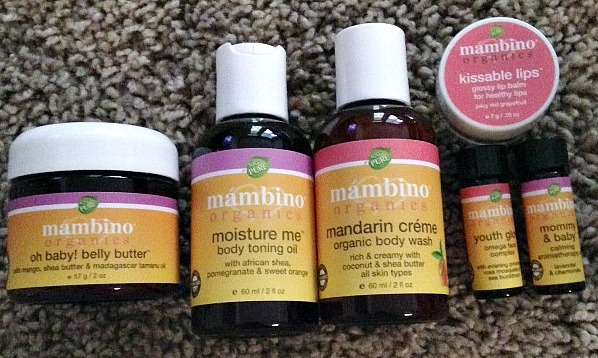 I also got an extra item from Mambino Organics as a gift called Mommy and Baby Calming Aromatherapy. My favorite of the products that comes in the Bun in the Oven Kit is the belly butter. On the bottle it says it “softens appearance of old and prevents new stretch marks”, also it “restores elasticity and hydration while soothing dry, itchy skin”. From the two times I have used the belly butter I can already tell that it has been working. I have been less itchy and I have not gotten as many distinct stretch marks this pregnancy like I had last pregnancy, I hadn’t done anything to prevent them last time. I also love the smell, it smells just like mangoes. Before you use the belly butter there are two other products you can use with it to help in the prevention of stretch marks. Those products are mandarin crème and moisture me which are both provided in the bun in the oven kit. The Mandarin Crème is an organic body wash. It has a strong scent of mandarin oranges which I loved. On the bottle it says it is “100% pure and natural” and it “doesn’t strip the skins protective oils”. I used this recently and it made my skin very soft. After using the body wash you then use the moisture me on your damp skin. Moisture me is a body toning oil which “boosts collagen levels, and discourages cellulite and is made with 100% vegetarian ingredients”. The scent was not my favorite, it was a lot like youth glow, but right after applying it to my skin I could all ready see that it looked healthier and brighter. Another one of the products I liked a lot was the kissable lips. It is juicy red grapefruit but the scent is very calm that it is hard to tell what it smells like exactly. I put it on about an hour ago and my lips feel so soft that I probably won’t have to put more on for another hour or so. One of the products that was not my favorite was the youth glow. I put this on about 30 minutes ago and my face still feels oily from it. I also am not a big fan of it’s scent which the only way I know how to describe it is sweet and bitter. I probably will not use this on a regular basis. The final product I got to try out was not from the bun in the oven kit, it was the mommy and baby calming aromatherapy oil. It’s scent of lavender is very strong, I could smell it as soon as I opened the package. I got it after my morning sickness had passed but on the bottle it says it is good with helping with nausea and morning sickness. Those were all the products I tried and I was happy with most of them and am glad to include them into my daily skincare. 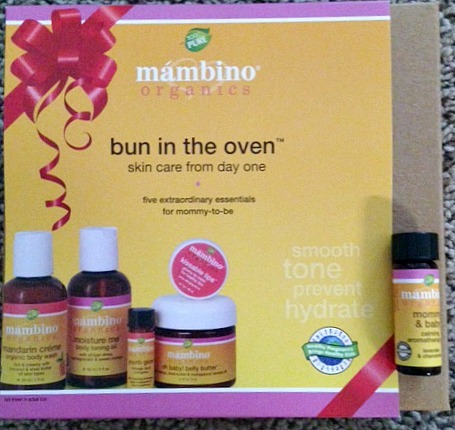 For one lucky reader, Mambino Organics is going to giveaway a Bun in the Oven kit. Enter below in the rafflecopter! Good Luck! « Is He Sleeping Through the Night? I love the Mommy & Baby Bonding Kit! The Scar Repair Booster looks like a product I’d like to try. Thanks for the opportunity. I would love to try the Mommy & Baby Calming Aromatherapy Oil. Would love to try the product.